Each shop has a unique story to tell about how they started or the history of the building their shop is in. You never know how unique a shop truly is until you speak with the people who are apart of it. 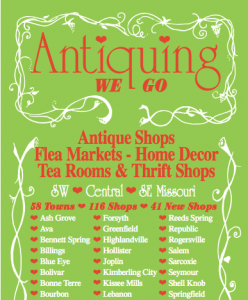 Hello, I am Cheri Russell, owner of the “Antiquing We Go” brochure (est. 1985) in Ozark, Missouri. I love shopping till I drop searching for that one find that brings back a cherished childhood memory. I like the one on one of knowing each shop owner and what they carry, so if someone asks me where to find something I can personally tell them where to go. I have a passion for all things that relate to family and childhood memories. My husband, Mike is a double purple heart Vietnam Veteran, and it’s been a family tradition to go shopping together on our anniversary yearly on Christmas Eve. My immense love for antiques led to me creating the brochure for other antique lovers to search for that special find that connects them to past memories. I am also a passionate entrepreneur with a love for helping others. I am a Brand Ambassador for Daymond John from Shark Tank.